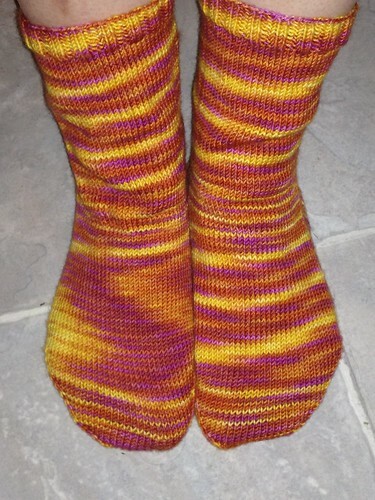 Champagne and Socks » Finished Socks! Sounds like the project you need is to find more cool things that can be made with single skeins. Like all those fat quarter/scrap quilt books out there. A friend of mine makes awesome patchwork style pieces out of knitted squares & rectangles, then uses those either as throws & blankets, or as the main panel of a pretty bag. then of course there are some gorgeous patterns out there for knitted toys/objects. I still love that sushi you made me. Not that there’s anything wrong with socks, of course, but you don’t have to confine yourself to tradition or making practical objects. You can make art too! I second the patchwork square suggestion. I do that with squares in different patterns. It’s a great way to use small amounts of yarn. I think I saw someone online use theirs for crocheting granny squares. Definitely a nice way to use up the scrap yarn. I definitely have at least one One Skein projects book but I dunno … so many craft things seem to be patterns for the sake of making things rather than things you really want. Like … knitted bowls or something. The knitted sushi and stuff are definitely fun but not the kind of thing you’d use for hand dyed yarn. You know I got in the mail today the most beautiful hand dyed yarn in a colourway called “orchid” but kinda looks like watermelon or similar. And it’s sock yarn and it looks like it would make the most beautiful pair of socks and I want to make them into socks and then … I’m thinking, “really? socks? come on! !” so I might see. I guess i don’t have to decide to right now.